Ready to hit the refresh button on your spring style with some retro glam accessories? Here's how it's done. They always say that if you hang around long enough, trends will always come back around again. Call your mom because she will absolutely recognize some of the accessory trend flashbacks that came stomping down the Spring 2018 runways. And, to be honest, this is a good thing. Like, really good. Everything old isn't just new again: it's kind of awesome. This fresh supply of time-honored beauty assistants is right on time for spring when you're just about sick to death of your hairstyle and need to mix up your look. "Incorporating accessories is a nice way to refresh a hairstyle, like a ponytail or a braid," explains James Pecis, hairstylist and Oribe Global Ambassador, a mane man who crafts some of the coolest looks you see on the runway. "You can also use accessories as an extension of your outfit, helping people to express their look." The best part about these retro hair accessories: there are absolutely no rules when it comes to using them. Not anymore. "There isn't a right or wrong," says Pecis. "I would go with what makes you feel confident and fun! 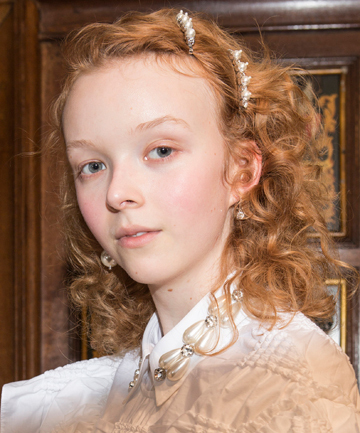 Ribbons and barrettes can look amazing on curly hair, like we saw on the Simone Rocha Spring 2018 runway. We had such a variety of natural textures and barrettes were used on everyone, placing them in a quirky way."